This jacket is made of silk thread. However, in spite of the expensive materials, people wore jackets like these only informally in the home from the late 16th century until the early 18th century. The jackets were made in rectangular pieces, possibly by teams of knitters who each knitted the same panel over and over again. The pieces of this one are not well finished, which suggests that the purchaser may have joined it together. Two pieces have been let into the sides at a later date, probably in the 1620s or 1630s when waistlines grew wider. The pattern of this garment is influenced by contemporary woven silk designs, which nearly always featured flowers. It is knitted in stocking stitch using green and gold silk thread, with some of the outlined floral motifs in reverse stocking stitch. The floral motifs were skilfully made, though the gold thread is only loosely stranded across the back of the stitches. The basket work around the hem is in alternate blocks of stocking and purl stitch and the front edges in garter stitch. 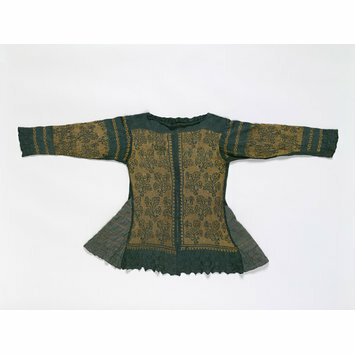 European museum collections have a number of similar jackets and tunics which may have been made in centres of production like Venice. 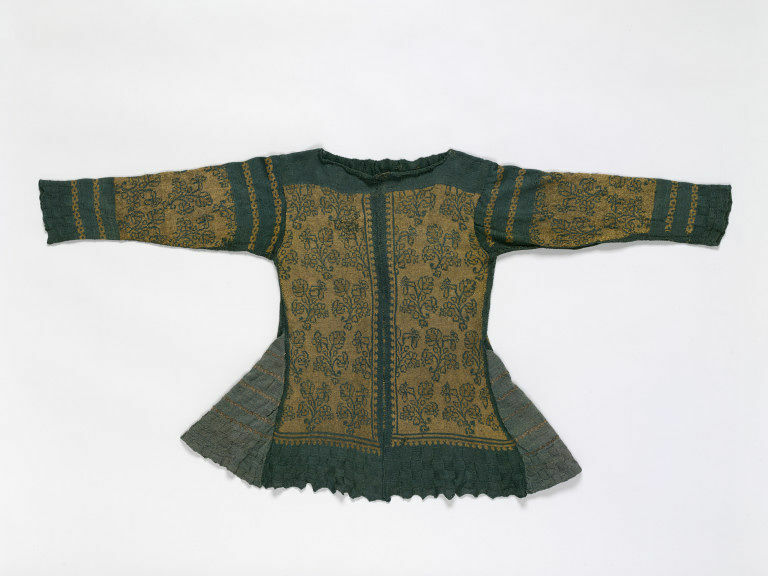 Loose fitting jacket of green and silver-wrapped yellow silk thread, made from hand or possibly frame-knitted rectangular panels, hand-sewn together. Knitted green and yellow silk jacket, Italian, 17th century. Levey, Santina M. Illustrations of the History of Knitting Selected from the Collection of the Victoria and Albert Museum. Textile History Volume 1, Number 2, December 1969. Plate IIIA.